Most authorship scholars are aware of the existence of the Northumberland Manuscript, named for the location of its discovery in 1867, Northumberland House, the last of the great mansions to be built in that row along the Strand that fronted on the Thames. Consisting of a parchment folder containing several manuscripts stitched together, six of them by Francis Bacon, it’s one of the many bits and pieces of this story that continue to float in intellectual space with no solid connection to the history of the period. As the Baconians point out, it’s ignored by mainstream Shakespeare scholars, though less because it points to Bacon as Shakespeare (it doesn’t) than simply because they don’t know what to make of it. Though damaged by fire in the 18th century, enough remains to add to the mysteries that surround the history of Elizabethan literature and who wrote it. Most interesting, and perplexing, is that along with Bacon’s name on the cover is also the name William Shakespeare, both written several times, though seemingly unconnected. Equally interesting is the fact that Northumberland House stood next door to York House, where Francis Bacon lived during the years he was Lord Keeper. Known first as Northampton House, Northumberland House was built in the early years of James’s reign by Oxford’s great enemy, Henry Howard, Earl of Northampton, who either bequeathed or sold it to his relatives, the Suffolk earls, at some point before his death in 1614. In the 1640s the Suffolk descendant sold it to the Earl of Northumberland, in whose family, the great Percies of the North, it remained until 1866, when they sold it to the City to be torn down to make way for the streets leading into Trafalgar Square––which was when the manuscript was discovered. It has remained with the Percy family ever since, in the vast archives at Alnwick Castle. Almost everyone agrees that the folder and its contents were originally compiled in or around 1596 and ’97 by Francis Bacon or one of his secretaries. This because his name appears in a number of places on the cover along with a list of titles, of which six of the nine manuscripts inside the cover are copies of his works, most of them pointing to this time period. Of most importance to authorship scholars is the fact that it’s the only Elizabethan document that contains the names of both William Shakespeare and Francis Bacon on a single page, however unconnected. Since readers who wish to pursue the evidence on their own can find more details at several websites online, I’ll confine myself here to those that relate to what I see as the most likely origin and purpose of the folder and its contents. First, it seems clear to me that because Bacon’s name––“ffrauncis Bacon”––and the title of what sounds like one of his essays is written in the upper right corner in larger letters than any of the other jottings, the folder was created to hold drafts of his essays, the one named––“of Tribute, or giving what is due”––being perhaps the first to require it. No essay by this name appears in his published Essays, but he may have decided not to use it, or else included it as part of a longer piece. Beneath this is a series of four phrases that suggest a note to himself that four kinds of praise must be addressed, of or to: virtue, affection, power, and person. Since Bacon does have an essay on praise, this suggests that at this point he is using the folder himself (I have found nothing on his handwriting on this document, so can’t comment on that, more than to say that he was a chameleon in so many ways, and so into hiding, that he probably had a number of different hands for different purposes.) Beneath this is his name jotted in different forms in what seems to be an attempt to arrive at the proper means of identifying himself on the title page of his essays, when he got around to publishing them. 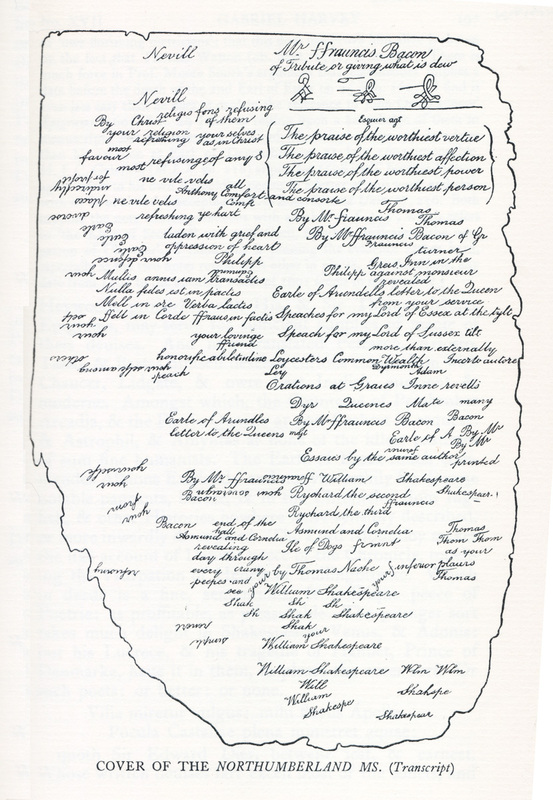 Surrounding these titles and longer phrases are a mass of single words and short phrases, many of them repeats of his name and words and phrases used in signing letters, so that it seems clear that at a certain point, either Bacon himself or secretaries used the space on the cover, perhaps to practise their penmanship, or to make sure their pen was properly inked––something that those of us who began our school days with the old steel pens and inkwells will understand. The cover was sitting on the desk close to the writer, and somust have become something of a scratch pad (paper was too scarce in those days to be used for scribbling). That the folder was sometimes upside down on the desk is reflected in the upside-down words scattered along the left edge, which would have been the right edge when it was turned around. Following a scattering of single words of the pen-testing variety, comes a list of titles of what would seem to be manuscripts contained in the folder at a time when it was being used to hold other things than drafts of his essays. Listed are: “Earl of Arundel’s letter to the Queen; Speeches for my lord of Essex at the tilt; Speech for my Lord of Sussex tilt; Leicester’s Commonwealth; Orations at Gray’s Inn Revels.” I don’t know what Earl of Arundel this refers to; the most likely is Philip Howard who died in the Tower in October 1595, exciting a good deal of sympathy from many in Bacon’s group. The speeches would have been written by Bacon for the earls he worked for to recite or read at the tilts held most years including 1595. Leicester’s Commonwealth was a libelous diatribe, probably written by Charles Arundel in 1584; the word “fragment” next to it suggests it was not a complete copy. Orations at Gray’s Inn were written for the holiday festival of 1594 of which Bacon was the chief organizer and during which Shakespeare’s Comedy of Errors was performed. Squeezed in at the head of this list is “Philip against monsieur,” presumably the letter that got Sidney in so much trouble with Queen Elizabeth back in 1580. This and the copy of Leicester’s Commonwealth suggest that at some point the folder became a repository for manuscripts of a particularly sensitive nature. From the beginning the folder was meant to contain private papers. At first these were drafts of the essays that he would not have wanted anyone but perhaps his personal secretary to see, suggesting that it was kept separate from the mass of his papers, perhaps under lock and key. Most likely it was used as a repository for works that were meant to be published, as witness the phrase on the back, “put into type.” As time went by, perhaps as the essays were finished and published, the folder became a repository for other things that Bacon wished to keep separate, drafts of sensitive letters perhaps, and copies of works by others that he did not want known were in his possession. Like most scholars, I believe that the repetition of Bacon’s name plus the titles of some of his works suggest that it began as the property of Francis Bacon. 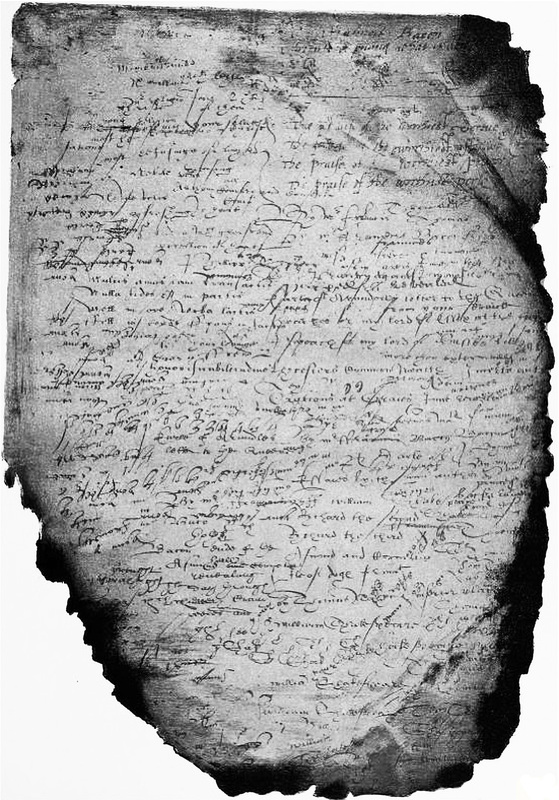 I would suggest that it remained among Bacon’s papers until 1621 when he was forced to vacate York House, perhaps rather suddenly, and that somehow, perhaps through the offices of one of his servants, it got passed to friendly hands at Northampton House next door, now owned by the Earl of Suffolk (no friend of Bacon’s, but lords don’t always know what their servants are up to). Bacon was forced to leave York House because the King wanted it for his favorite, Bacon’s former protégé the Duke of Buckingham, who found it easier to hate the friend he’s destroyed out of greed for his property. For a certain time the folder would have been political dynamite, yet soon enough it would have simply have disappeared into the stacks of old papers in some repository in the great complex of wings and rooms in Northumberland House. That the thing about papers. There’s nothing inherently tempting about an old parchment folder covered with scribbles. Among the scattered words and phrases on the folder cover that call for explanation are the name William Shakespeare and the titles of two of his plays, Richard II and Richard III. Considering how scarce is anything that refers to Shakespeare from this period, this puts this folder at the top of the rather small pile of seemingly unrelated pieces of the Shakespeare puzzle, yet orthodox Shakespeare scholars, disturbed perhaps by the proximity of Shakespeare’s name to that of Francis Bacon, tend to ignore it, along with the fact that the plays listed are the first two Shakespeare plays to be published under the name Shakespeare. Understandably, Baconians claim this as evidence that Bacon was Shakespeare. That’s no more a certainty than that Francis was using the cover to practise writing his own name. What is evident is, first that he was privy to the coverup during the period when it first began, and second that the coverup was tied to the publication of the two Richard plays. Scholars have assumed that the folder once held manuscripts of the plays. That may well be true, although the titles are in the lower center of the folder, nowhere near the table of contents in the upper right corner. Somebody had to help Shakespeare’s company, the Lord Chamberlain’s Men, get the two plays published in 1597 and ’98, during their battle to the death with Robert Cecil. If the folder was being used––at least for a time––as a repository for manuscripts on their way to the publisher, as the phrase “put into type” suggests, then it may be that it was Oxford’s friend and literary colleague Francis Bacon who, in 1596, was the major instrument for getting these two plays published. That their titles were jotted on the cover could be a clue written by a secretary that the plays were in the folder, and that William Shakespeare (or Shakespear, also jotted) was the name to be put on their title pages. That the author’s name was left off the 1596 editions fits with the likelihood that the sharers, particularly their manager Hemmings and their patron Lord Hunsdon, were not in agreement with how to handle the authorship problem. By October of the following year, Hunsdon was dead and the Company, just returned from the road, published the plays with the name William Shake-spear on the title page (hyphenated, suggesting that it was a pseudonym). Equally interesting is that the name Thomas Nashe and the title of the play Isle of Dogs, the play that a few months earlier had forced the Lord Chamberlain’s Men to hit the road, is jotted on the cover not far from the Shakespeare names and titles. Here we see evidence of Bacon’s own play and one of his most notable cover names. More evidence, however slight, that ties Bacon to Nashe is the word “honorificabiletudine,” a word that Shakespeare, making fun of pedants Holofernes and Nathaniel in Act V of Love’s Labour’s Lost, addressed to Moth, taken by scholars to represent Nashe, and that Bacon, as Nashe, then used in Piers Penniless. (Both Bacon and Oxford would have been aware of the word since literary folk from Dante on down used it as an example of how Latin grammar could result in a word of ridiculous length.) It makes sense that he, or his secretary, would jot it down to assure himself of its spelling before writing it in the fair copy of Piers Penniless intended for the printer. This would push the origins of the folder to 1592 or earlier, when Piers Penniless was published. Thus the story as it comes together suggests that, by 1592, Bacon, spurred by Mary Sidney’s publication of her brother’s works under his own name in 1591 and by the realization that with Robert Cecil on the Privy Council where he could attack the literary community at will, the time for letting go of youthful literary pranks was at hand. He would establish himself as a writer of literature by publishing under his own name serious essays similar to those of his brother’s friend Michel de Montaigne. He created the folder as a place to keep private the drafts of his essays from all but his closest secretary. As time went by, other scripts he wished to keep private were stored in the folder, which was kept separate from his other papers, perhaps under lock and key. The presence of the titles of the two Richard plays, plus the name Shakespeare spelled two ways, suggests that he held the manuscripts to these plays during the period when the name Shakespeare was first used on published plays, 1596 to 1597, also suggesting that he had something to do with the publication. Doubtless he would have been concerned about the fate of the folder, but there was little he could do, since he was forbidden by the king to return to York House following his disgrace. Luckily for fate, and us historians, the man who took York House from him, the Duke of Buckingham, was an ignoramus who had no notion of what was important and what wasn’t.